For many years water therapy (hydrotherapy) has been used with horses. While it provides all of the same benefits for dogs, it has only caught on in the canine arena over the last ten years. “Canine Water Therapy” is now recognized throughout the world as a beneficial modality for fitness, physical and psychological rehabilitation. Many veterinarians recommend swimming after orthopedic or neurologic surgery to help regain mobility, improve range of motion, and to rebuild muscle mass. Swimming is non weight bearing, and limb motion usually begins with the first visit, thus improving circulation. With improved circulation, dogs have the potential to heal quicker and more completely than dogs that have not received Canine Water Therapy. Older dogs benefit greatly from warm water therapy. Many senior dogs suffer from arthritis, dysplasia and musculoskeletal degeneration. Limbs become stiff making it difficult for the dog to move. This lack of activity causes muscles to atrophy. It becomes a snowball effect. The more your dog hurts, the less he moves; the less he moves, the more muscles will atrophy. For an older dog, swimming can help regain and as well as maintain vitality; this can improve symptoms of depression, often seen in older debilitated dogs. Swimming lessens the impact of gravity on aging joints, helps improve joint health, and eases the pain of arthritis. Aerobic activity via water therapy can help build muscle mass and improve muscle strength, making it easier for dogs to get around outside of the water too. A dog that can’t play ball on land will often become active in the water. There are many benefits to positive mental stimulation, one of which is improved emotional well-being. It is not uncommon to see dogs that can no longer chase and run on land suddenly become revitalized, physically and psychologically, when they realize they can retrieve their toy in the water. This revitalization can help dogs to regain confidence and sense of self. Often, a once debilitated, senior dog will want to play again or take longer walks after just a few sessions of hydrotherapy. More recently, warm water swimming has been used as a behavior training aid. The Canine Water Therapy Association notes that it has been shown to help dogs recover from emotional trauma, lack of socialization, aggression and hyperactivity. Working with a behaviorally challenged dog in the water allows for new, positive, experience in a controlled environment. Swimming helps build confidence in shy and under socialized dogs. The warm water has a calming effect that can help relieve anxiety. After a few sessions dogs can exhibit less nervousness, become more receptive to new experiences and focus better. These results have been attributed to a shift in brain chemicals, from anxiety based adrenalin to feel-good endorphins. 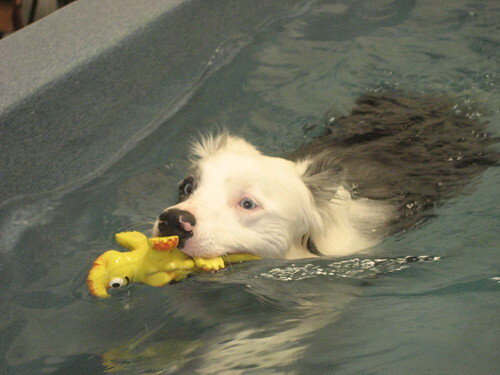 Canine athletes (sporting & working dogs) can reap the benefits swimming. By getting their bodies into peak physical condition, performance can be improved. Swimming helps stretch and strengthen muscles, increases flexibility and improves endurance. It teaches the dog to concentrate, allows to the potential to perform better and helps prevent injuries. Human athletes stay in top shape with a regular work-out routine, often including swimming and dogs should do the same. 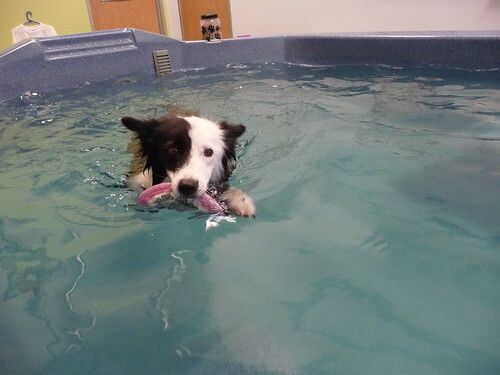 Canine Water Therapy should be a part of any canine athlete’s physical conditioning program. The dogs look like they really enjoy this! Dennis, the water is fantastic! Get your goggles on and join me for a swim. Next we learn how to surf! Love it! Looks like I could use that exercise/therapy program! that looks so cute, Zippy enjoys that….